Welcome! Neon Alchemy was created with the belief that we are all drawn to personal symbols. We specialize in creative guidance and meditation, to help you contemplate the presence of inspiration and symbolism in your life. Transform with a playful heart and reconnect with your inner visionary. Express your senses through colors, symbols and breath. We are passionate about helping you on your inner journey and offer a variety of sessions to help you on your way. At its core, creative meditation is about the essence of our own magic, and the ways we expand our energy. We look forward to helping you express your intention. Each week and month, we bring you a new meditation centered around color and visualization. Visit our calendar to see what's up next. We would love to have you join our next session! For those looking for a more personalized experience, we offer one-on-one sessions. 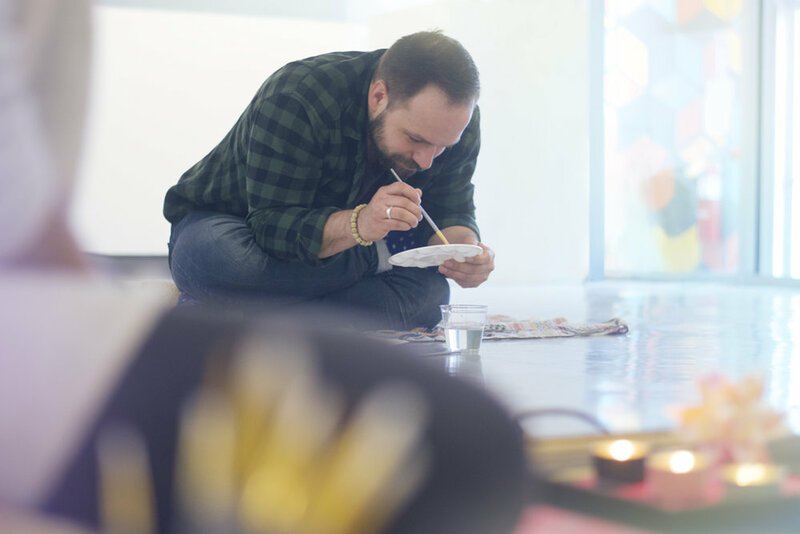 Bring an open heart and imagination as you are guided through a two-session series, customized to your creative intention. A truly special service. Commission a symbolic portrait, painted by founder and artist Sherleelah Jones. Portrait includes a meditative consultation to capture your highest intention, translated into symbolism and personal imagery.